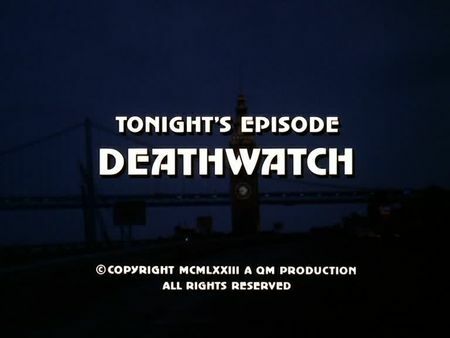 I have added the screencaps for Deathwatch to the episodes' page a couple of days ago; took me quite a time to blog about this, though. Two old fishermen and friends for a lifetime, Joe Porturo and Lou Roselli, are on their way back into the night-time harbour when they are witnessing a crew of a leisure boat transfering illegal immigrants onto another fishing boat. Both recognize and know each other, and soon after their return to the harbour, one of the old men is killed by the people smugglers whereas the other one is threatened and left behind with kind of a guilty conscience. Stone's and Keller's investigations are complicated since the only one who witnessed the murder remains silent, trying to take care of his friend's family. Finally, however, the indications help the two cops in approaching the background of the crime, and preventing a foolish effort for retaliation, including a quite spectacular chase on a Hovercraft boat of the US Coast Guard - which tested so-called 'air-cushioned vehicles' for Coast Guard use at that time in the San Francisco Bay. Most of the location filming was accomplished on the water and in the heart of Fisherman's Wharf, between Jones and Hyde Streets. The illegal immigrants are transferred to and dployed from an unidentified warehouse. The final act was filmed at the no longer existing US Coast Guard Fort Point Station and on water in the San Francisco Bay around the Golden Gate Bridge. Although the position of the boats for the transfer of illegal immigrants is supposed to be one and a half hour from San Francisco harbour, you can frequently see mirrorings of the Golden Gate Bridge in the windshield of Joe Porturo's fishing boat, and parts of the Marin Headlands and Tiburon in the background. By the way, this episode was probably quite a challenge for the filming team due to changing weather conditions comprising sunny skies in one sequence, and heavy rain in the other.